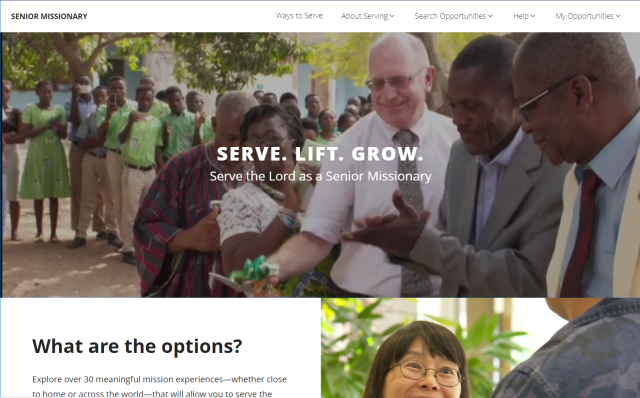 The Church has a new website to help potential senior missionaries find the right missionary opportunity, including humanitarian work, family history, teaching, leadership training, public affairs, health, and education. SeniorMissionary.lds.org can help connect you with volunteer opportunities around the world that best suit your abilities and preferences. There are even opportunities for part-time and full-time Church-service missions while living at home. The website represents the combined needs of all the departments in the Church that need senior missionaries. On this interactive website, you can compile a wish list of service opportunities. You input your preferences, including how long you want to serve, the level of expenses you can afford each month, and where you would like to live. You can also indicate special language skills, preferred assignments, and any medical needs that could impact your service. After searching, you can browse lists of available service opportunities that match the detailed criteria. When you are ready, you can submit your choices to your bishop, who will submit a recommendation to serve to Church headquarters. While finding these opportunities can greatly help Church leaders in making appropriate assignments, the call to serve full-time ultimately comes from a member of the Quorum of the Twelve Apostles.